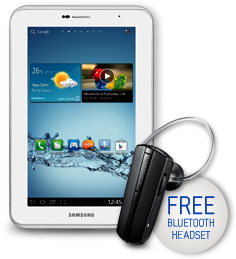 Samsung officially announced promo offer a free bluetooth head set with Galaxy Tab2. So those who are purchases Galaxy Tab2 from 1st August to 31st August 2012. Then enter your Galaxy Tab2 IMEI number, Mobile number and you email address. Click the submit button then submit your shipping details. Then upload your Galaxy Tab2 purchased invoice copy in jpeg or PDF format and submit. That's all if your details are valid you will receive a free bluetooth headset in 30 days.